"You turned on the lights and gave their biggest boogeyman a name." 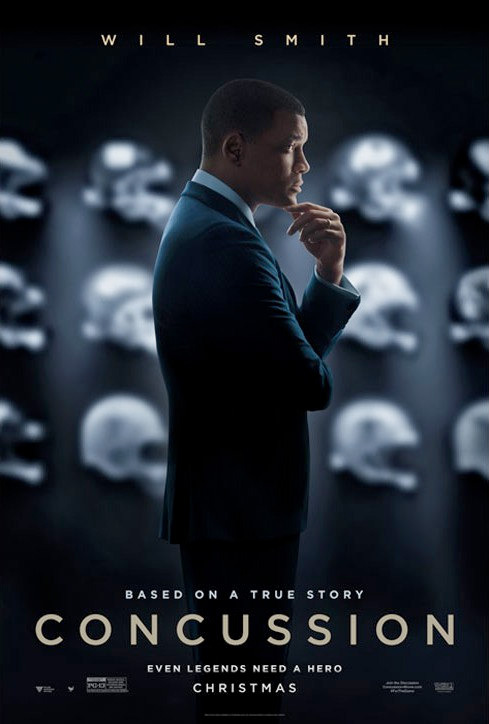 Sony Pictures has unveiled the first official trailer for Concussion, a very powerful drama starring Will Smith as Dr. Bennet Omalu, a real life neuropathologist who discovered how football-related trauma was becoming a health problem within the sport. They've been quietly holding onto this and positioning it for a strong awards-season push, with Smith giving it his all in the kind of emotionally riveting film that will earn a few nominations. The cast includes Alec Baldwin, Gugu Mbatha-Raw, Stephen Moyer, Eddie Marsan and many others. This is one of my most anticipated movies left to watch this year, the kind of powerful and subversive drama I love seeing. Will Smith stars in the incredible true David vs. Goliath story of Dr. Bennet Omalu, the brilliant forensic neuropathologist who made the first discovery of CTE, a football-related brain trauma, in a pro player. Concussion is both written and directed by American filmmaker Peter Landesman, of only the film Parkland and a few scripts previously. This is based on the true story of Dr. Bennet Omalu and the struggles he faced attempting to make the sport safer for players. Sony Pictures will release Concussion in theaters everywhere starting December 25th, Christmas Day, later this year. For more follow @ConcussionMovie. With all his poor movie decisions lately I had almost forgotten that Will Smith is one of the best acting talents in history. I always chuckle at how good of an actor the Fresh Prince of Bel Air is in films. Who would have thought it? // It is hard to tell whether people are serious anymore. and I stand with ya. Agreed. Not the best actor today but he is good and usually does good work. Will Smith is the greatist actor of our time. Oh yeah. BWAH HA HA HA!!!!!! It's TRUE!!! Yeah, the movie thinks its slick but fails miserably. I was close to shutting it off. Yeah I never shut it off but it was one of the worst movies I've seen in a long time. Too many films to list that contradict this statement. Amazing! Is Will Smith wearing prosthetics? Maybe his age is finally catching up to him. This looks incredible. The shots look Fincher-esque. This movie allegedley already has the NFL and NCAA shaking in there boots..good! Looks interesting. Terrible title though. Always sceptical to Smith, but always underestimating him as well.. This looks like it has good, not fantastic, weight to the acting. On a side note, im gonna love seeing Will NOT smiling his fresh prince smile for a whole movie.